Companies providing alternatives to conventional cigarettes have been trying to put the regulations on the vaping and e-cigarette industry on radar at the Conservative Party Conference this week. 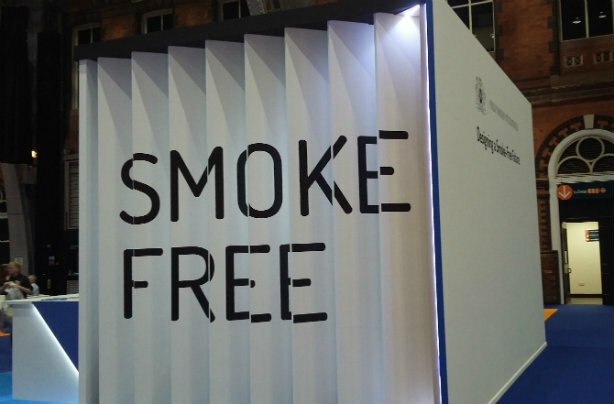 Conference delegates cannot avoid seeing tobacco giant Philip Morris International's (PMI) large and prominently positioned stand (below) in the exhibition space, which declares the firm's goal to eventually move entirely away from convetional cigarettes. The firm is showing off its IQOS product, a 'heat not burn' product that reduces harmful chemical emissions by heating rather than buring the tobacco inside - although delegates wanting to trial it must do so outdoors. One of its staff on duty at the conference is Kate Marley, the firm's new head of government affairs. Marley is a long-time Conservative adviser who worked with David Cameron in opposition and in government, and with Jo Johnson MP, before leaving Westminster when Cameron left office last summer. Peter Nixon, the business' MD for the UK and Ireland for PMI, told PRWeek: "We're the biggest tobacco company in the world. We also sell vaping products and we announced last year that we’re going to move towards a smoke-free future, replacing cigarettes with alternatives to cigarettes... we're here to meet with stakeholders and talk about how we achieve that." Nixon said that the Government's recently-launched tobacco strategy shows it is on a "similar path" to the firm. James Hargrave, head of public affairs for the UK Vaping Industry Association, told a fringe event that vaping companies were not being given a chance to shape legislation around their products. "You wouldn’t look at pharmaceutical industry regulation without consulting the pharmaceutical industry… [but] the door is closed to us," Hargrave told an event organised by the Institute of Economic Affairs at conference yesterday. Hargrave himself is actually employed by the agency JBP Associates, of which UKVIA is a client. "Our mission is to build consumer confidence in the sector," he told the event, adding that vaping products are "treated akin to... if not more harshly" than conventional combustibles in terms of regulations. He said that an Advertising Standards Authority consultation, which closes shortly, on relaxation restrictions on advertising e-cigarettes was "a step in the right direction" and called the new inclusion of e-cigarettes in the Stoptober campaign by Public Health England a "welcome move". The IEA's event was titled 'Vaping: Could Brexit be good for our health? ', with a number of panellists arguing that exiting the EU would free the UK of "truly terrible" regulations on tobacco products, namely the Tobacco Products Directive, part of the EU's Article 20. Bob Blackman MP, secretary of the All Party Parliamentary Group on Smoking and Health, argued there was not yet enough long-term evidence on e-cigarette use, and said policy changes should be made with that point in mind. Christopher Snowdon, head of lifestyle economics at the think-tank, told the panel that products with the potential to reduce smoking-related disease were not getting the exposure they deserved. "There’s no way you can communicate about it... we need a somewhat more liberal marketing and advertising model so people can hear about them," he said. Snowdon also vaped on the platform during the session. Snowdon could later be seen alongside dozens of attendees at a late-night reception held by Vype, the alternative products brand of British American Tobacco, and supported by the publishing company Dods Group. "Vype, the UK’s leading e-cigarette brand, invites you to join us for a drinks reception that will explore the UK’s leadership in this dynamic and innovative sector, the importance of quality in this rapidly developing industry and the opportunities presented to this category in a post-Brexit Britain," read the event invite. Attendees were given free Vype products. The latest APPC register shows EUK Consulting and FTI Consulting as doing work for British American Tobacco. FTI also works for Imperial Tobacco Group. No other firms on the register have clients with the word 'tobacco' in their name. JBP is not an APPC member, but is in the PRCA.